Jeff Rudkin has been an educator for many years along with outstanding accomplishments! His classes have participated in the Peace in the Streets Global Film Festival since the beginning in 2014, wining age 9-13 age group award that year! They have had many entries with place winners each year since. His students have also won the C-SPAN Student Cam, the International Student Film Festival Hollywood (many times), the Newport Beach Film Festival Youth Showcase, the National School Board Association / Apple Moviefest, and had many International Student Media Festival winning projects.. They have also won ten Telly Awards and many other national youth film and video festivals. His students are very proud of their participation in the Peace in the Streets Global Film Festivals and hope that their films about peace, respect, unsung heroes, the Holocaust, and anti-bullying films are helping to make a difference in the world. Jeff Rudkin has taught video production to 7th and 8th graders at Lora Batchelor Middle School in Bloomington, Indiana for 27 years. He is the sponsor of the school’s B-TV program, which has won more than 600 state, national, and international awards at film and media festivals. His students were the only students granted official press accreditation for the 60th, 65th, and 70th Anniversary of the Liberation of Auschwitz Ceremonies in Poland in 2005, 2010, and 2015. The group has also been honored by the National School Board Association (twice), the Indiana State Legislature (twice), and C-SPAN. The students have traveled all over the country (Hollywood, New York City, Dallas, Chicago, Florida, Nashville, etc.) to have their work featured, and have shot documentaries in England, Australia, New Zealand, Hawaii, Fiji, Ireland, France, Wales, and Poland. The B-TV students currently skype every other week with their partner school, Bourne Community College in England, as well as monthly with students from their partner schools in Auckland, New Zealand (Murray’s Bay Intermediate), and Morocco. Rudkins’ B-TV class has been featured in the Milken Foundation “Connections” publication, the Kennedy Center’s “Artsedge” website, and USA Today, among many other national publications. 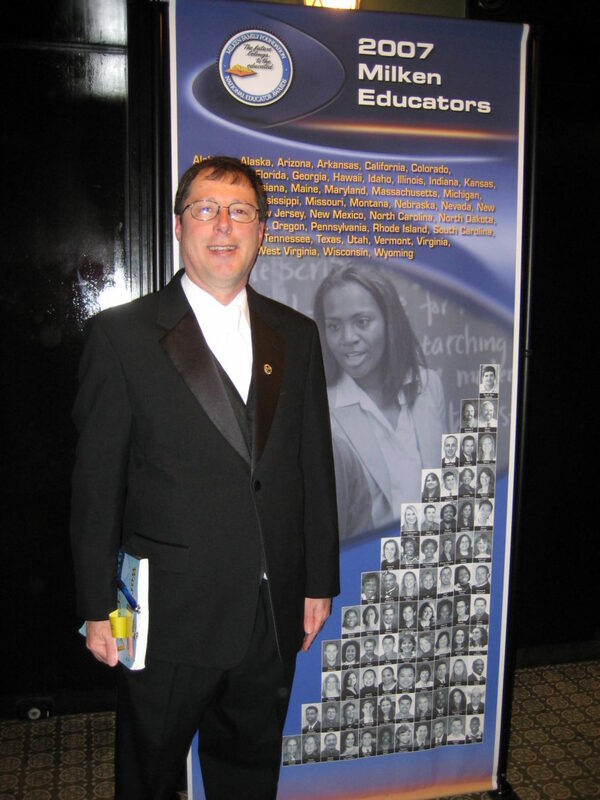 Jeff Rudkin was a 2007 Milken Educator, a 2012 Milken Center Fellow, and the 2010 Irena Sendler Award finalist. He has been awarded the 2011 International Student Film Festival Hollywood Award of Excellence, the 2007 International Student Media Festival Connelly Award (Outstanding Educator), the 2005 Indiana University Armstrong Educator Award, the 2004 Indiana State Teachers’ Association Multi-Media/Technology Award, as well as several local teacher awards. He also wrote two successful Best Buy Teach grants for his classroom ($10,000 and $5000) as well as a national Best Buy Teach grant of $100,000 for the Bloomington school system. He has also written multiple CAPE grants for his program that total $35,000. He has been a speaker at the National School Board Association National Conference and the Indiana University Celebration of Teaching Awards. We are Grateful each year that he continues to participate in our festival. His presence, education, knowledge of film making and awareness of youth is amazing!